Regular readers of our blog will know that at the Australian National Dictionary Centre we recently initiated a new feature on our website called Word Box. This feature enables members of the public to submit words that are either new to them or used in an unfamiliar way. Word Box is alerting us to new words and meanings that may be used in updating our general dictionaries, or included in our collection of Australian words. The team at the ANDC would like to thank all those who have already contributed to Word Box, and we encourage everyone to participate. Here are a few of the more interesting contributions. batmanning – (of a person) hanging upside down like a bat, often in unusual places, for the purpose of posting an image on a social media site. The term refers to the cartoon character Batman, hero of the recent movie series, who adopted a similar bat-like pose. 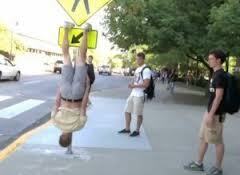 It looks as if this term emerged recently on the back of the 2011 social media phenomenon ‘planking’. See also owling below. cripping up – (of a non-disabled actor) performing the role of a person with a disability. Derived from the word ‘cripple’ – an offensive term for a disabled person. Evidence from around 2008. Fonzie flat (also known as a Fonzie apartment) – a self-contained dwelling above a garage. Named after the character Fonzie (played by Henry Winkler) in the US television series Happy Days (1974-1984); the Fonz lived in rooms over the Cunninghams’ garage. Initial research suggests that this may be an Australian term beginning in the mid-2000s. Glamping - camping in style! glamping – the activity of camping with luxury accoutrements. This word is a blend of ‘glamorous’ and ‘camping’. 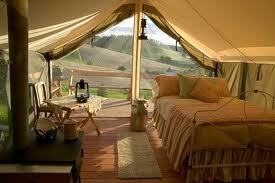 There is also evidence for glamper ‘a person who goes glamping’ and glamp ‘to camp in this way’. Evidence from the mid-2000s. meow (also known as meow meow, miaow, or miaow miaow) – the synthetic drug mephedrone used as a stimulant, with similar effects to amphetamine and cocaine. The colloquial or street name is derived from ‘MCAT’, an abbreviation of the chemical name of the drug ‘4-methylmethcathinone’. Evidence from around 2009.
owling – (of a person) crouching still and staring straight ahead, often in unusual places, for the purpose of posting an image on a social media site. Compare with batmanning above. We welcome comments and further information on these recent terms submitted by Word Box contributors. This entry was posted in ANDC, new words, Word Box and tagged batmanning, cripping up, Fonzie flat, glamp, glamper, glamping, green on blue, meow, meow meow, owlling by Mark Gwynn. Bookmark the permalink.